In this lecture we indicate how to complete the last step in the process outlined at the beginning of Part II: to take our knowledge of the classification and representation theory of complex algebras and groups and deduce the corresponding statements in the real case. 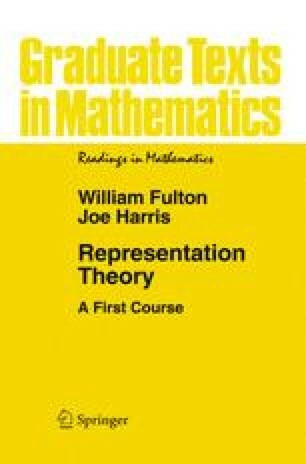 We do this in the first section, giving a list of the simple classical real Lie algebras and saying a few words about the corresponding groups and their (complex) representations. The existence of a compact group whose Lie algebra has as complexification a given semisimple complex Lie algebra makes it possible to give another (indeed, the original) way to prove the Weyl character formula; we sketch this in §26.2. Finally, we can ask in regard to real Lie groupsGa question analogous to one asked for the representations of fmite groups in §3.5: which of the complex representationsVofGactually come from real ones. We answer this in the most commonly encountered cases in §26.3. In this final lecture, proofs, when we attempt them, are generally only sketched and may require more than the usual fortitude from the reader.